Evolution is "change" and one of the most consistent phenomena of life is "change". Change is to alter, to vary, to substitute, and to mutate. The complexity of life itself is brought about by change. Our individuality is fashioned by change. In the process of gamete formation, the genes within the germ cell undergo a complex rearrangement referred to as "meiosis". During this event, the chromatids of homologous chromosomes participate in an almost ritualistic exchange of genetic materials called "crossing-over" or "recombination". At the end of this process, paternal and maternal genes are recombined uniquely to produce an arrangement of genes never before encountered. This ultimate change produces a unique individual generation after generation. Whether you are an "evolutionist" or a "creationist", change constitutes the main element of the process in which you believe. The entire theory of evolution glorifies "change". Evolution derives its substance from the theory of "survival of the fittest". The fittest are fittest because they have undergone change called "mutation", which confers on them reproductive superiority in a constantly changing environment. Therefore, the "fittest" have a "selective advantage" to deal with a changed environment. The creationist should remember the story of creation very well. It consisted of a series of changes. As the narrative goes, "And the earth was without form, and void; and darkness was upon the face of the deep. And the spirit of God moved upon the face of the waters. And God said, "Let there be light: and there was light" (see Genesis 1: 2- 3). Light was the very first change God brought to bear in the process of His creation. The story of God's creation becomes even more fascinating as you read the rest of the book of Genesis. It shows how God changed the world and the beauty therein painstakingly. It also shows the changes that were introduced into our very existence when the first Humans disobeyed the instructions of God. "Change" therefore is life itself. The profession of medicine has been quite active in the arena of "change". Health care systems undergo changes and, except for a few exceptions, the changes are for the better. The way in which we train physicians has changed. The management of disease entities changes constantly. Even the disease entities that we treat and available therapeutic modalities undergo continual changes. Remember the "Bubonic Plague" called the "black death" in the middle ages. This is an infectious disease caused by the bacteria, Yersina pestis, is associated with high rate of fatality. It is characterized by generalized lymphadenopathy, some of which are suppurative (boils or bubos) and accompanied by intense adenitis and pneumonia. This plague, which was transmitted to humans from infected rats by rat fleas, devastated mankind then. Unless you tumble into it in old textbooks, this plague has never resurfaced in the ecology of human diseases since that time. Even the term plague has disappeared from the medical vocabulary. These days, we would have called it an "Epidemic", easily treatable with Erythromycin or Tetracycline. Albert Camus, the 1957 Nobel laureate in Literature, immortalized this disease in his well-acclaimed 1948 novel, "The Plague". The setting of this literary work was Algiers in North Africa. What about Drugs? See how many changes have occurred. Until 1944 when Sir Alexander Fleming and his collaborators, Ernst Chain and Sir Howard Florey, discovered Penicillin, no antimicrobials existed for the treatment of infections. In 60 years since that time, there has been an explosion in the classes of antibiotics. As fast as we have created new classes and forms of antibiotics, so too have changes occurred in the organisms these antibiotics are meant to treat. If these organisms did not have such a propensity to change, they would have been wiped out of our existence. It is difficult for me to imagine a world without bacteria. Can you? Following the path of this discussion so far, it will be a great academic exercise to explore all of the exciting changes that have occurred in various facets of medicine. We can talk about the emergence of molecular biology and how our understanding of the basic structure of DNA has revolutionized medical concepts. We can talk about all of the new diseases that are treatable by recombinant DNA technology. We can talk about the discovery of sophisticated imaging technology, more advanced than the Magnetic Resonance imaging, and how it has revolutionized our diagnostic potentials. We can talk about today's surgical ingenuity not imagined possible 5 years ago. These changes that have occurred have been as a result of our ever-increasing curiosity to chip into the frontiers of the unknown. The boundary between what we know and what we do not know is very thin. The changes in life have come from our insatiable urge to explore this boundary to expose the unknown. This is the greatness of this creation of God, called HUMAN. With our unenviable ranking as the 187th nation in the world in terms of the health sector, the theme for this Golden Jubilee celebration, "Health Care Development in the last 50 Years" is most fitting. Therefore, I am going to review the evolution of healthcare systems in our beloved country, NIGERIA. This review will touch upon the changes that have occurred and I will leave you to determine whether these changes have meant progress, stagnation or retrogression. It would seem from available accounts that the earliest form of Western-style health care in Nigeria was provided by doctors brought by explorers and traders to cater for their own well being. The services were not available to the indigenes. It was the church missionaries that first established health care services for the people. In this regard, tribute must be paid to the Roman Catholic mission, the Church Missionary Society (Anglican) and the American Baptist Mission. It is stated that the first health care facility in the county was a dispensary opened in 1880 by the Church Missionary Society in Obosi, followed by others in Onitsha and Ibadan in 1886. However, the first hospital in Nigeria was the Sacred Heart Hospital in Abeokuta, built by the Roman Catholic Mission in 1885. There are several anecdotal reports of practices within these missionary health care facilities to suggest that they were primarily used as tools for winning converts and expanding their followership. Consequently, these facilities were competitive rather than complementary. In spite of this fact, they were of such high quality that, by Independence in 1960, Mission-owned hospitals were more than Government-owned hospitals ( 118: 101). This high quality is also evidenced by the fact that the Seventh Day Adventist Hospital in Ilesha as well as the Wesley Guild Hospital in Ile-Ife became the nucleus of the teaching Hospital complex of a major university in Nigeria. Even today in Nigeria, the Baptist Hospitals in Ogbomsho and Eku function as referral centers in the health care delivery matrix. Because of the evangelical functions of these health care facilities, it was left for the government to organize and develop policies for general health care. It is well known that towards the end of 19th century, European powers were at war with each other for ownership of the vast rich land of Africa. They established frontiers needed to be secure and so there was a powerful British military presence in Nigeria. For the military, which was located in Lokoja, the British for therefore established medical services there. Under the Governor, Lord Lugard, Lokoja was the military headquarters in 1900. Aside from military health services, civilian services were also established and it is known that the first government hospital for civilians, the St. Margaret's Hospital, was built in Calabar in 1889. At the time World War I ( 1914- 1918) was ending, present day Nigeria was being born by the amalgamation of the Northern and Southern regions. This war produced a lot of military activities in Nigeria, leading to the establishment of several military health care facilities, some of which were left to function as civilian hospitals after the war. With time, several government-owned health care facilities were established, ranging from rural health centers to general hospitals. At the turn of the century, medical services, as is the case with some other services, in Gambia, Sierra Leone, Ghana (then Gold Coast) and Nigeria were merged and controlled by the Colonial Office in London. This was the first centralization of control of health services in West Africa. The Colonial Office determined the services that were available and provided the manpower. As health care management became more complex, the central administration of health care services became regionalized, while maintaining some common West African facilities such as the West African Council for Medical Research, which came into being in February 1954. In Nigeria specifically, medical services developed and expanded with industrialization. Most medical doctors were civil servants, except those working for missionary hospitals, who combined evangelical work with healing. Among the civil service doctors, one was appointed the Chief Medical Officer, who became the principal executor of health care policies in Nigeria. Along with his several other junior colleagues (Senior Medical Officers and Medical Officers), they formed the nucleus of the Ministry of Health in Lagos. The details of centralized administration of health services up to this point are complex and they reflect the complex political transformation of the whole region. Between 1952 and 1954, the control of medical services was transferred to the Regional governments, as was the control of other services. Consequently, each of the three regions (eastern, western and northern) set up their own Ministries of Health, in addition to the Federal Ministry of Health. Although the federal government was responsible for most of the health budget of the States, the state governments were free to allocate the health care budget as they deemed fit. Nigeria's Five year Strategic Plan from 2004 - 2008 All of these plans formulated goals for nationwide health care services. The overall national policy for Nationwide Health Care Services was clearly stated in a 1954 Eastern Nigeria government report on "Policy for Medical and Health Services." This report stated that the aim was to provide national health services for ALL. The report emphasized that since urban services were well developed (by our standards then), the government intended to expand rural services. These rural services would be in the form of rural hospitals of 20- 24 beds, supervised by a medical officer, who would also supervise dispensaries, maternal and child welfare clinics and preventive work (such as sanitation workers). The policy made local governments contribute to the cost of developing and maintaining such rural services, with grants-in-aid from the regional government. This report was extensive and detailed in its description of the services envisaged. This was the policy before and during Independence. After independence in 1960, the same basic health care policy was pursued. By the time the Third National Development Plan was produced in 1975, more than 20 years after the report mentioned above, not much had been done to achieve the goals of the Nationwide Health Care Services policy. This plan, which was described by General Yakubu Gowon, the then Head of the Military Government, as "A Monument to Progress", stated, "Development trends in the health sector have not been marked by any spectacular achievement during the past decade". This development plan appeared to have focused attention on trying to improve the numerical strength of existing facilities rather than evolving a clear health care policy. The Fourth National Development plan ( 1981- 1985) addressed the issue of preventive health services for the first time. The policy statement contained in this plan called for the implementation of the Basic Health Services Scheme (BHSS), which provides for the establishment of three levels of health care facilities; namely 1) Comprehensive Health Centers (CHC) to serve communities of more than 20, 000 people; 2) Primary Health Centers (PHC) to serve communities of 5000 to 20, 000 persons; and 3) Health Clinics (HC) to serve 2000 to 5000 persons. Thus, a CHC would have at least 1 PHC in it catchment area (ideally 4) and a PHC would have at least 1 HC in its catchment area (ideally 2). These institutions were to be built and operated by state and local governments with financial aid from the federal government. By this policy, the provision of health services would be the joint responsibility of the federal, state and local governments. In its outlook, this policy is not different from the one published in 1954 by the Eastern Nigerian Government previously mentioned. Nigeria is currently made up of 36 states and over 500 local government areas. Each local government area (LGA) is made up of between 150, 000 to 250, 000 people. By the scheme proposed in the Fourth National Development plan, each LGA would have a minimum of 7 PHCs and 30 HCs with at least one CHC at the apex of the health care services. The larger LGAs would each have, at least 12 PHCs and 50 HCs feeding into one or more CHCs. Nigeria has not come close to achieving this lofty objective. As a matter of fact, services that existed were deteriorating hopelessly, leading to various industrial actions by all classes of doctors in the 80's. This has continued even today. On the last day of 1983, a new Military Government came into being in Nigeria and one of the reasons it gave for the Military intervention was the state of health services, declaring "our teaching hospitals have been reduced to mere consulting clinics." One of the government's first efforts was to revise the Fourth National Development Plan. The health strategy under this revised plan gradually shifted emphasis to primary health care. Although this has always been the ultimate goal of the plan, the political will did not seem to exist for its implementation. The adoption of the WHO target of Health for All by the Year 2000 by the federal government was marked by shifts in emphasis and structural changes in health care administration. At the federal level, the Directorate of National Health planning had the function of coordination and implementation of the national health policy. It also had the function of developing plans for national health. At the state level, were state health advisory councils whose function it was to give general advice to the Commissioner of Health in the performance of his functions. At the local government level, the State Ministry of Local Government in consultation with the State Ministry of Health established Local Government Health Committees covering their area of authority for the purposes of formulating policies for providing health services to the communities. At the community level, several small communities had evolved small community primary health care services with active community participation. In more recent Nigeria, this lofty goal has not been achieved. The capacities of the facilities that emerged from previous efforts have been stretched and infrastructure broken beyond repair. Primary health care services now exist only in name. The common man has reverted to the herbalist and traditional healers for care because of access and affordability issues. The elites have perfected medical tourism to India, Singapore, South Africa and even Ghana. This is in the face of a rapidly changing disease patterns in which infectious diseases have been replaced by behavioral, environmental and poverty-related diseases. The record shows that in 1979, there were 562 General Hospitals, 16 Maternity and Pediatric Hospitals, 11Armed Forces Hospitals, 6 Teaching Hospitals and 3 prison Hospitals and they all accounted for 44, 600 hospital beds. In addition to these, there were estimated 600 Health Centers, 2740 General clinics, 930 Maternity Homes and 1240 Maternity Health Centers. By 1985, 13% of the hospital beds were provided by 84 Federal Institutions while 47% of the hospital beds were provided by 3, 023 hospitals owned by the State Governments. The rest of the beds were provided by 6331 health facilities owned by Local governments ( 11% of the beds) and 1, 436 private hospitals ( 14% of the beds). 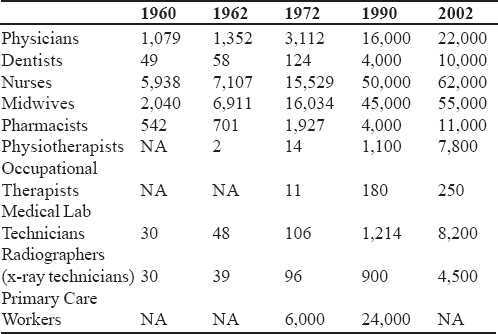 In [Table 1] and [Table 2], I have tried to capture the health manpower situation in Nigeria since Independence in 1960. The Federal Ministry of Health is the planning and coordinating body for health services issues. The state governments through their Ministries of Health implement national programs and run state health institutions while the local governments ensure the delivery of health care to the masses. The federal government "dictates the tune", and provides the bulk of the money for paying the "piper." Over 90% of the money for health care services come directly or indirectly from the federal government, which has allowed the states some independence and freedom to spend the money as they see fit. The states, in the same way, allow the local governments some freedom in the way they spend the money. Because the federal government provides over 90% of the money for health, a look at the federal allocation to health will give a clear indication of the position that health care occupies in the list of the government's priorities. The opening sentence of the Chapter on Health, in the Third National Development Plan, states, "Development trends in the health sector have not been marked by any spectacular achievement during the past decade." In the same way, the financial allocation to health did not show any remarkable improvement in the decade that followed independence. During the Third National Development Plan of April 1, 1975 to March 31, 1980, N689 million naira was planned to be spent on health care out of an anticipated total expenditure of N43,000 million. This comes to only 1.6% of the total proposed expenditure for health. There are, unfortunately, no statistics to show the actual amount spent. Because of the instability of the Naira, the picture can be made clearer by converting to the dollar. In 1975, the Naira was almost $2.00 and the population of Nigeria was estimated as 75 Million people. Per capita expenditure on health therefore was about $18.40 in 1975. For the same period of time, defense was allocated 5.1% of the total proposed expenditure. The Fourth National Development Plan of January 1, 1981 to December 31, 1985 was a lot kinder to health, with an allocation of N3066.6 million out of a proposed N69,686.3 Million, which comes to 4.4%. If we accept that 3066.6 Million Naira was spent on health in that plan, it will be equivalent to $5519.88 Million (exchange rate in 1981 was one Naira = $1.80). With a population of almost 90 Million at that time, the health expenditure per capita would have been $61.3. However, the downward turn in Nigeria's economy began during this period, leading to major cuts in budgetary allocations. There is little doubt that the actual amount spent on health was not close to the 4.4% of the total budget. In fact, in terms of percentage of the total budget, the first full budget of the Babangida government that came into power on August 27, 1985 was very unkind to health. What makes it even more outrageous is the fact that the poor state of health was cited as one of the justification for overthrowing the previous government. In that year, health was allocated 2.7% of the total budget, while defense received 7.8% of the budget. This was also the time when Babangida orchestrated a rapid devaluation of the Naira that has continued a downward spiral since that time. It is very difficult to find a rationale for such poor allocation to health. It is almost impossible now to ascertain budgetary allocations to health in the Nigerian system. The States have been given more freedom to pursue health care policies and to allocate monies as they see fit. In the 2004 federal budget 99.8 billion Naira (N) was allocated for all government services. The Federal Ministry of Health got 26.4 billion Naira, while Defense got 10.6 billion Naira. The Ministry of Health, therefore, got nearly 26% of the total budget for health. Does this translate to money available for the well-being of the people? A critical look at the budgetary allocations will prove otherwise. The budget deliberately mixed capital expenditure with recurrent expenditure. For example, as much as 7 billion Naira was voted to rehabilitate 8 teaching hospitals in the budget. In spite of this shortcoming the budget, on the surface, appears to be very kind to health. However, given the fact that the Naira at that time was $0.007 and, given the fact that the population was estimated then at about 130 Million, the per capita expenditure was only about $1.42, if all of the money allocated was actually released. This is abysmal to say the least. [Table 3] is my attempt to give a graphic picture of health financing situation. Several international organizations have played phenomenal roles in the development and maintenance of health services in Nigeria. Unfortunately most of these contributions pass through government (mostly federal government), which has kept very little record of the impact these contributions have made. Also, records of the exact cash amount of these contributions are sketchy, partly because of poor government record-keeping and partly because a lot of the contributions are in services, and in equipment and training, whose cash amount is normally difficult to establish. These organizations include the World Bank, United States Agency for International Development (USAID), WHO, UNICEF, and British Technical Assistance (BTA). In a collaborative effort between the Nigerian government, USAID, and WHO, a very successful program was launched against smallpox and measles in 1967 and 1968. Whereas USAID financed the cost of technical immunization expense, the Nigerian government and WHO provided medical personnel and local costs. This program was so successful in Lagos that in 1968, a 97% efficiency was estimated for it, with more than 90% of the target population immunized. The success of this program against smallpox was so remarkable that by mid-1968, smallpox incidence had dropped to only 2 cases a month in Western Nigeria, mostly among immigrants. In the 1960's several projects aimed at controlling malaria (that accounted for about 11% of all mortality) were launched by WHO and UNICEF. The Expanded Program on Immunization (EPI), Oral Rehydration Therapy (ORT), and bore-hole projects for drinking water are all areas in which UNICEF's contributions are immense. There are several investigative projects, such as the Guinea worm project in Anambra State, in which WHO and, later the Jimmy Carter foundation, had invested substantial amounts of money. During the cholera epidemic in Nigeria in 1970-71, WHO established cholera diagnosis and treatment centers throughout the country. But without this timely intervention by the world body, it is generally agreed that the losses to human life would have been catastrophic. Today these agencies, along with the United States government, through the President's Emergency Plan for AIDS Relief (PEPFAR), as well as private philanthropic organizations, such as the Jimmy Carter Foundation, the Bill Gates Foundation, the Bill Clinton Foundation, etc., have contributed to support efforts in various sectors of the Nigerian health scene, particularly HIV/AIDS. Once again the exact monetary contributions are impossible to estimate. Perinatal mortality: This is the number of stillbirths plus death within the first week of life out of a total of 1000 births (dead or alive). The perinatal mortality rate in all of Africa south of the Sahara, excluding South Africa, is generally thought to be 100-110 per 1000. In Nigeria, the figure is not different. At the University of Benin Teaching Hospital in Nigeria, Omene and co-workers reported that the perinatal mortality rate was 89 in 1974, but it dropped to 33 in 1980 and by 1986 it was back up to 57. In 1990 no reliable data is available, but it is estimated that the rate is near the 1974 level. The reduction of the rate by two-thirds between 1974 and 1980 coincided with the development of an aggressive and effective neonatology program at the Teaching Hospital which reduced to almost zero the deaths within the first week of life. Today from the same hospital the perinatal mortality rate is as high as 110-120 per 1000. Infant mortality rate: This is the death of an infant before the first birthday and it is measured as the number of deaths per 1000 infants. In Nigeria, this figure in 1960 was 190; in 1978 it was 157 and the latest figures obtained for 1988 range from 104 to 110. There are lots of concerns with the figures for 1988 because they do not appear to be consistent with the realities of the health situation in Nigeria. However, the situation has improved somewhat over the last 20 years. The United States Central Intelligence Agency now publishes a "Factbook" on State of the Worlds Health and it has estimated Infant Mortality for Nigeria since 2003, as follows: In 2003, Infant Mortality was 71.35, but in 2004, it rose to 98.8, which was a 38.5% jump. It remained unchanged in 2005 and dipped slightly in 2006 to 97.14. In 2007, it dipped further to 95.52, then remained at 95.72 in 2008, 94.25 in 2009 and, this year, it is 94.35. According to UNICEF's report on the "State of the World's Children" in 2010, Infant Mortality in 1990 was 120 while in 2008, it was 96. No reason was given for this decline, but credit must go to Health Care Institutions and health care providers. Under-5 mortality: This is the total number of infants that die before their fifth birthday and the rate is measured per 1000 children. This value includes the infant mortality rate. For Nigeria, this value was 318 in 1960, 209 in 1978 and 174 by the latest data of 1988. As is the case with the infant mortality data, we have concerns that the 1988 figures may have grossly underestimated the enormity of this problem in Nigeria. UNICEF's "State of the World's Children 2010" reports that in 1990, Under-5 mortality rate in Nigeria was 230, and in 2008, it was 186. There are only 30 nations with under-5 mortality of greater than 170 and Nigeria is one of them. In 2007, the federal Ministry of Health published a report on Integrated Maternal, Newborn and Child Health Strategy, in which it is stated, "The country loses 2,300 under-five year olds and 145 women of childbearing age every day, making Nigeria the second largest contributor to the under-five (U5MR) and maternal rat e(MMR) in the world" . In a separate report published in Lancet in 2003, Black and co-workers stated that 1 million Nigerian children die before their fifth birthday every year, a figure that amounts to 10% of the world total annual deaths. Prematurity: This is the birth of a baby, whose gestational age is between 28 and 37 weeks. In Nigeria, the estimated rate as of 1984 is between 5 and 7.5%. Because of obvious worsening health care services, this value is probably higher now. Today, it looks as if nobody cares enough to keep any records. Low birth weight: This is the birth of a baby that weighs less than 2500 grams. Whereas the frequency in the USA and most developed countries in about 6%, the frequency in Nigeria in the late 1970's to early 1980's was 20-25%, with unpublished evidence that it is getting worse. Today no published data is readily available. Maternal mortality: This is the death of a mother arising from complications of childbirth, measured in this report, as number of deaths per 100,000 births. Whereas in the USA this value is about 8, in Nigeria the 1988 value is 800, meaning that 8 out of every 1000 births is likely to result in maternal death, a figure that is 100 times higher than in the USA. The World Bank reports 1500 in 1980 but UNICEF reports 800 in 1988. It is difficult to conceive of a nearly 50% reduction in maternal mortality, when the evidence available seems to suggest a declining state of general well being since 1980. Today the estimate is about 1100 but the data is at best questionable. If maternal mortality rate is about 1100 in Nigeria, a country with a population of about 150 million, it means that about 53,000 women die from pregnancy-related complications every year in Nigeria. Given that the global pregnancy-related maternal death is estimated at 529,000, it means that Nigeria contributes about 10% of world maternal deaths. There have been many advocates for safe-motherhood in Nigeria. None is so persistent, so knowledgeable and so passionate as Professor Kelsey Harrison, whose many writings on this subject, I hope, can be made available as a publication for posterity. One cannot even imagine how Professor Harrison and his countless protιgι's feel about a subject they have invested so much effort in, yet making no substantial dent on the painful statistics. In one of his most recent public addresses in Nigeria, Professor Harrison states, "One of the greatest failings in Nigeria and one that is partly responsible for much of the confused state of affairs be it in health care or whatever, is not knowing enough about the past and unwillingness to learn from it." Population: Nigeria's population at Independence in 1960 was estimated at 46 million. In 30 years the population reached 110 million. It is estimated that the population growth rate between 1965 and 1980 was 2.5%; but between 1980 and 1990, the growth rate is about 3.5%. The current growth rate is about 4%, 4 times higher than in the USA and 6 times higher than in Japan. Nigeria is the tenth most populous nation in the world with a population estimated at 150-160 million. One out of every four Black Africans is a Nigerian. GNP per Capita: Nigeria is ranked the 158th poorest country in the world out of 177 countries surveyed, according to the 2005 Human Development report, also cited by the Federal Ministry of Health report of 2007. In 1994, the World Bank reported a figure of US$260. By 2005, the World Bank reported a value of US$360. In 2009 however, the United States Central Intelligence Agency World Factbook reports a value of US$2400. This amount is still being used today, although everyone knows that it is inaccurate in view of the fall in the value of Nigerian currency without a corresponding rise in the overall Gross National Product. Also, the distortion of this value by the wide gap between the rich and the poor is not reflected. The proportion of the population that is below absolute poverty is not certain in Nigeria, but estimates ranged from 65 to 85 percent 10 years ago, but now it is about 53%. Life expectancy: This is the number of years newborn children would live if subject to the mortality risks prevailing for the cross-section of the population at the time of their birth. For Nigeria, the life expectancy was 40 in 1960 and it is generally believed that it was 51 for all sexes ( 49 for males and 53 for females) in 1990. Today it is estimated at 42 (thanks to the scourge of HIV/AIDS). Immunization of children and pregnant women: For a one-year-old to be fully immunized, he must have received 1 BCG (TB), 2 or 3 DPT (diphtheria, pertussis, tetanus), 2 or 3 OPV (oral polio vaccine) and 2 MMR (measles, mumps and Rubella). In the absence of MMR, measles only. The data available for 1960 is very scanty, but the estimate is 5- 10%. The data for 1981 is about 23%, while for 1988 it is close to 75%, reaching a high point of about 80% in 1990. This represents 6- 10 fold improvement in this health status indicator since independence. The 1983- 1986 massive EPI (Expanded Program of Immunization) campaign supported by the federal and state governments with huge financial and material aid from UNICEF achieved enormous success in this regard. Today there is a shameful decline in the percentage of eligible children immunized. The available UNICEF data puts the number at 13%. I will like to give this issue some prominence here because it highlights our failure not only in leadership but also in effective policy-making. The 13% of fully immunized children in Nigeria is the lowest in the world, even lower than in many countries in perennial conflict, such as the Republic of Congo. In some states in Nigeria, the rate is less than 1%. Nigeria's performance on routine immunization has continued to decline since the high point achieved in 1990, so states the Nigerian Demographic Health Survey (NDHS) in 2003 and supported by the National Immunization Coverage survey (NICS) conducted by National Program on Immunization (NPI). As already stated, under- 5 mortality rate was nearly 200/ 1000 and it is estimated that Vaccine Preventable Diseases (VPD) accounts for about 22% of these. About 5 million babies are born in Nigeria every year, which means that nearly 1 million children die annually out of which > 200, 000 are preventable if adequately immunized. The immunization of mothers against tetanus was equally successful. Whereas in 1960 this was rare, by 1981 about 11% of pregnant mothers were being immunized against tetanus to protect their unborn babies form neonatal tetanus, which has a near 100% fatality rate. By 1988, this figure has jumped to 20%. This success can also be credited to the EPI campaign. Today the value is less than 5% by all accounts. [Table 6] and [Table 7] are my attempts at summarizing this information. The data that is available for assessing Nigeria's main Health Problems are very fragmented, unreliable and almost impossible to interpret. I have selected only a few disease entities to highlight the fact that there is a changing pattern of disease prevalence among the sick in Nigeria. Malnutrition is age-specific, occurring in the under-5 year old. Whereas only 10 to 15% of all sick children were malnourished in 1960, in 1990 and 2000, the value was between 50 and 60 %. Another age-specific disease, Measles, showed a downward trend in 1990, but by 2000, the figure was back up to 1960 rate. This is probably because of relaxation of the immunization initiatives of the 80's and early 90's. Hypertension is also age-specific and seen amongst adults 18 and above. No record was available to me for 1960 but, in 1990, hypertension was seen in 20% of all adults in Nigeria. The data for 2000 puts the rate at 30% to 35%. It is my belief that if the population is screened again, the frequency of hypertension will be much higher than that of 1990 because of new stresses and new uncertainties. Trauma has taken a giant leap among the health care problems of Nigerians. It is believed to be the most common cause of death amongst Nigerians, particularly trauma arising from Road Traffic accidents. Homicide is now a close second. Homicide is strictly speaking not a health care problem because those affected are already dead, needing no health care. However, it has reached an epidemic proportion, adversely affecting the economic and social life of Nigerians. The feeling of insecurity has created a feeling of pervasive fear in every section of Nigeria. Consequently, the very sick cannot be rushed to the hospital or to a health care facility in the middle of the night. It is for this reason alone that Homicide is included among major health problems. It will be impossible to discuss the full impact of HIV/ AIDS on the health of Nigerians. The prevalence of HIV/AIDS in Nigeria is 5.4% among 15 to 40 year olds. It varies from 7.0% in North Central to 3.2% in North West. It is found in every socio-economic group, from civil servants to students. It is a rapidly fatal disease, associated with frequent infections and the classic "wasting syndrome". Because of HIV/AIDS, the entire African continent is filled with children without parents. It has impacted the economy of Nigeria adversely, such as loss of investment, increases in healthcare costs, reduced life expectancy, fertility rate and decrease revenue because most fatalities occur among those in their most productive years. In agriculture, it has caused decreased crop productivity and loss of international competitiveness. In developed countries, this disease has stretched health care financing to its limit. In the USA, for an individual with HIV/AIDS to be treated adequately with the full complement of anti-retroviral drugs, it costs $2000/person/month. There are about 5.2 million Nigerians with HIV/AIDS. In the 2004 budget, only Six Billion Naira was voted for the treatment of the disease. This amounts to $8.07/person/year. What a colossal joke! Sadly also is the fact that governments in Nigeria have not leveraged or made full use of the resources and opportunities for improving HIV prevention, including screening, treatment, care and support provided by PEPFAR and agencies such as Bill gates Foundation. Which Way Forward in the 21st Century? As you may imagine, I have reflected upon this question for a long time. As I reflect upon this, it dawned on me that the answer to our Health care problems cannot be too far away. In a more global sense, Nigeria's problems can only be solved by Nigerians and, by that same reasoning, Nigeria's health care problems can only be solved by Nigeria's health care providers. In every civilized society of the world, doctors usually lead the provision of health care. Just as the credit for sound health care go to doctors, so must the blame for abysmal health care go to doctors. Therefore, my candid opinion is that the solutions to our health care problems lie in the hands of doctors. To ensure that Medical and Dental Practitioners... uphold the Hippocratic Oath. To promote the advancement of Health, and allied Sciences. To assist... Nigeria in the provision of smooth, efficient and effective health care delivery system. To promote the welfare and interaction of all medical and dental practitioners in the Country. To co-operate with organizations anywhere in the world which have similar aims and objectives. To consider and express views on all proposed legislations and national issues especially those affecting health care delivery system and medical and dental education in Nigeria. Securing in accordance with provisions of this Law the establishment and maintenance of registers of persons entitled to practice as members of the medical or dental profession and the publication from time to time of lists of those persons. he holds a certificate of experience issued in pursuance of section 11 of this Act. (2) Subject as aforesaid, a person shall be entitled to register any postgraduate qualification if the qualification is approved by the Council in a specialized branch of medicine or dental surgery. Among other provisions, Section 9 of the law gives power to the Council to approve courses of training, institutions awarding medical degrees and the standard of medical education. Section 10 of the law empowers the NMDC not only to monitor curriculum of Medical Schools, but also to monitor the conduct of examinations for the award of medical degrees. Subject to subsection (2) of this section, no medical practitioner or dental surgeon shall practice as a medical practitioner or dental surgeon as the case may be, in any year unless he has paid to the Council in respect of that year the appropriate practicing fees prescribed. A medical practitioner or dental surgeon during his service year in the National Youth Service Corps Scheme shall be exempted from the payment of practicing fees. The Council may, with the approval of the Minister from time to time, vary the practicing fees prescribed under subsection (1) of this section. 30 per cent to the Medical and Dental Council of Nigeria. Any medical practitioner or dental surgeon who in respect of any year and without paying the prescribed practicing fees practices as such shall be guilty of an offence. The composition of the NMDC is very homogeneous professionally (all members must be doctors) but very heterogeneous demographically. One representative of the Armed Forces Medical Services. Two pathologists to be appointed by the Nigerian National Post-Graduate Medical College. Of the 59 members of Council, 9 are appointed by the NMA (>15% of the total) and 2 by the Nigerian Dental Council (NDA). Together, the associations have 11 members (almost 19%), the most powerful single interest group. With a little bit of effort, the NMA can influence the appointments of a number of the other members. The laws give this association unbelievable amount of powers as far as the conduct, training and practice of medicine goes in Nigeria. Inadequate financial allocation to health. An economy that is plagued by large scale corruption by custodians of the economy, a largely single export economy, huge inflation and ever widening gap between the "haves" and the "have-nots". In which of these areas can NMA have influence? A population which is growing too rapidly needs an extensive investment in public education and family planning. Can the NMA exert any influence in this area? The unequal distribution of health care facilities and manpower needs a sustained recognition of the health care problems of the rural areas. Does the NMA have the mandate to speak to this issue? Nigeria needs an aggressive and persistent pursuit of primary health care program that can reach the masses. As a former Federal Minister of health, Professor Olikoye Ransome-Kuti, put it, "…the goal of health for all through primary care can only be achieved through persistence and determination" . In his time, Professor Ransome-Kuti was a leader of a movement for responsible implementation of Health Policies like no one else. His brother, Dr. Beko Ransome-Kuti, who was once a very dynamic vice-president of the NMA and chairman of the Lagos State branch, suffered personal humiliations and indignity in his crusade for better health for Nigerians. Many great NMA leaders before and after him suffered similar fate begging our political leaders to be sensitive to the health care needs of our people. Nigeria needs a budgetary allocation to health that meets WHO recommendation of a minimum of 5% of the GNP. Can the NMA rise to the occasion and hold our leaders accountable for not honoring this basic world standard? Nigeria needs the political "WILL" to confront the looters of our treasury and to evolve policies that can diversify our economy. Nigeria needs to rebuild our middle class which has literally been wiped out of existence. Does the NMA have the political "WILL" to challenge the status quo? The NMA is a very powerful establishment by law. I will summarize by asking a few more, not so rhetorical, questions. Does the law give any doctor the option of refusing to pay dues to the NMA? The law makes every doctor practicing in Nigeria technically a member of the NMA. Does the NMA have the power to regular the conduct of medical practice in Nigeria? Does the NMA have the power to establish guidelines for the establishment of health clinics? Does the NMA have the power to provide guidelines for changing curriculum for medical instruction at all levels of training? Obviously if this happens, a new crop of doctors appropriately suited to meeting the challenges of health care delivery in Nigeria will emerge. It is well known that we cannot attain Global intellectual growth and recognition without developing local talents and expertise. Effective Graduate (Post-graduate) training is the only way of doing this. The NMA, as it stands today, plays no role whatsoever in the conduct and the training of our local experts. That should not be so. We must however, pay tribute to the Medical and Dental Consultants of Nigeria (MDCAN), for their relentless efforts in this regard. The NMA must assume leadership in all facets of medical training, and use this power under the law in distributing responsibilities to various stakeholders in order to achieve well articulated goals in medical education at all levels of training. The first important step in this regard, in my opinion, is a moderated "Strategic Planning" session involving all interest groups. Does the NMA have the power to establish minimum standards of education needed for licensure as a doctor? Does the NMA have the power to establish minimum standards for any institution we call a "Hospital"? Does the NMA have the mandate to speak to the issue of emergency preparedness for our country? Will the NMA enjoy the backing of its members if it takes a strong position about the "epidemic" of homicides in Nigeria? How many doctors and innocent citizens will be murdered in cold blood before we know that it is an epidemic? How many kidnappings of doctors and their family members will it take to make a pronouncement of leadership failure in combating our society's ills? The NMA is a very powerful establishment by law. Only doctors can lead the march that will rekindle society's faith in our health care system. Only doctors can prevail on doctors to remember the sanctity of the "Hippocratic Oath". In this presentation, I have tried to discuss with you my thoughts about the changes in the health care systems in Nigeria. I have also tried to paint a realistic picture of the state of our health care today. I never set out, from the title of my presentation, to try to give you solutions to the problems. I only promised to suggest to you, the way forward and, in my opinion, that way is through the Nigerian Medical Association. True, the picture of our health care today is pathetic. In spite of that, we have very able compatriots at home who have defied all odds and continue to carry the burden of health care delivery under hostile circumstances. We salute their efforts. My thanks to the President of the Association of Nigerian Physicians in the Americas (ANPA), Dr, Julius Kpaduwa, and the ANPA Executive, Dr. Fiemu Nwariaku (President-Elect), Dr. Yele Aluko (Immediate Past President), and Dr. Nkem Chukwumerije (Treasurer) for encouraging me to produce this work and for sponsoring my trip to Nigeria to deliver this keynote address. Thanks also to Dr. Prosper Igboeli, President of NMA and to Professor Stanley N.C. Anyanwu, Chair of the Program Committee for selecting me as the keynote speaker. Special thanks to Dr. Deji Adefuye and Dr. George Ntiri for suggestions and editorial work. 2. Chuke P. O. Nigeria: In Saltman, R.B. Ed. The International Handbook of Health Care Systems. Greenwood Press, N.Y, 1988. 3. Bull, Mary Medical Services in Nigeria, 1954-55. Oxford Development Project Report. 4. WHO 7th Report on World Health Situations, Vol. 2. African Regional Office, Brazzaville, 1987. 5. Fendall N. R. E. A History of the Yaba School of Medicine, Nigeria. W. African Medical J., 1967; 16: 118. 6. State of the World's Children, 1990. UNICEF, Oxford University Press. 7. CIA Factbook: Published by the Central Intelligence Agency of the USA, 2010. 8. State of the World's Children, 2010. UNICEF Publications. 9. Integrated Maternal, Newborn and Child Health Strategy, Federal Ministry of Health publication, Abuja, 2007. 10. Harrison K. A. Transforming Health Systems to Improve lives of Women and Newborn Babies in Nigeria. Keynote address. Presented to the Nigerian National Health Conference, Uyo, Nigeria, June 8, 2009. 11. Black R. E., Morris S.S., Bryce J. Where and why are 10 million children dying every year? The Lancet 361 (9378), 26 June, 2003, p2226-2229. 12. Ibrahim H. J., Alhassan A., Wakili I., Musa I., Bello M., Yusuf A., Rugayyah Y. Nigeria's losing battle against AIDS. TRUST. Friday, 16 April, 2010. 13. Ransome-Kuti O. Finding the Right Road to Health. World Health Forum 1987; 8: 161-163.